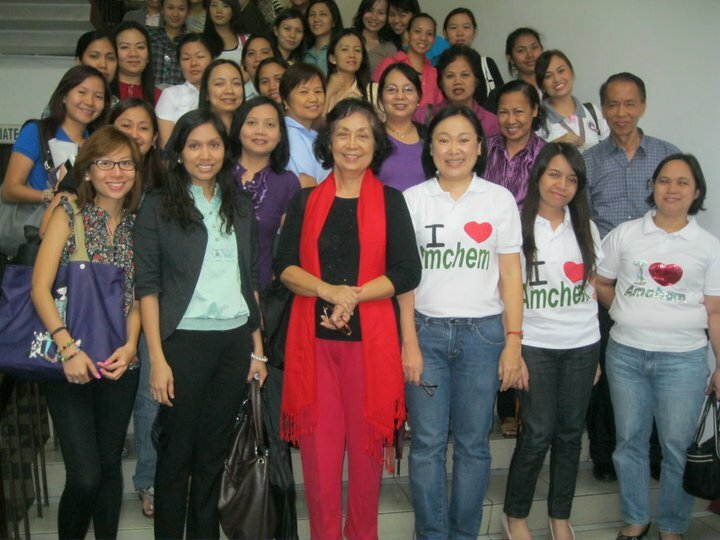 It all started in August of 1994, when Amchem introduced a chemist training program. The goal was to provide an extra dimension to its “after sales service”, by way of a training course program in cosmetic formulation. The course is similar to other cosmetic formulation training programs wherein a fee is usually paid, however, at Amchem, its all part of customer service, and is free of charge. It’s been seven years since then, and the program has proven to be a huge success. There has been a steady increasing number of attendance. At the beginning, the training sessions used to be held in the office conference room. But, as the number of participants increased, the conference room soon became too small to accommodate everyone, and it was time to look for a bigger venue. Lately, the training sessions have been held in prestigious Universities such as UST and CEU, with students in the audience. The large lecture halls of the universities, those big enough for at least a hundred people, with facilities such as projectors and microphones, were used to accommodate everyone. The Dean of colleges and their faculty were also present during the program. The National Anthem is played, and a prayer is read before the program begins. The Amchem CTP program has come a long way. It has been growing through the years, from its humble beginnings it is now a big event. For 2011, three training sessions have already been conducted, and there are three more scheduled before the end of the year. The next one will be on August 2, 2011 at 1:00pm in CEU. We hope to see everyone again. June 23 - CCIP- Discovery Suites. Mr. Roy of ISP presented the problems in the industry: Excise tax, harmonization, FDA increasing fees. Mr. Vallejos suggested to the body to deharmonization. He said the local should protect themselves. Mr. Soco announced to the body that Mr. Vallejos is the father of harmonization. Ana of VMV insisted on harmonization since their products were ready to take off in Thailand. Aran Puri responds to the issues he raised in his last column which asked what R&D and marketing want from raw material suppliers? In the April 2011 issue I wrote a provocative column about 'What R&D and marketing want from raw material suppliers'. I have since been bracing myself for an avalanche of strong comments from raw material suppliers telling me how one sided the article was and outlining their take on the problem and the facts. So I was completely taken aback by the very positive feedback I've received from raw material suppliers, many of whom are personal friends with many years of high level experience in the industry and can speak candidly without resorting to diplomatic speak. My reading of this is that raw material suppliers welcome and are willing to listen to all well meaning advice and they are prepared to make changes to the way they handle their relationship with their customers; eg R&D and marketing. Raw material suppliers for their part face challenges while dealing with their customers' R&D and marketing teams and outlined their thoughts to me in frank no-holds-barred discussions which I highlight in this column. Raw material suppliers feel strongly that it is vital to establish an open, trusting relationship with their customers' R&D and marketing. This in their opinion is the key to getting the best out of both parties. Raw material suppliers' paramount desire is for R&D/NPD teams to share the complete brief received from marketing without withholding any part or making changes to the brief. Any alteration to the marketing brief, however minor and well meaning, risks influencing the optimum response of the raw material supplier. This can result in recommendations that are not best suited to the needs of the brief issued by the marketing department. They understand that reticence of the R&D/NPD teams to do this stems from several factors. They need to discount any irrational fear that revealing the full brief might lead to leakage of the concept or tip off the marketing strategy of the raw material suppliers or their competitors. My advice on this matter is that you need to trust the integrity of the raw material suppliers. They strive to and deserve your absolute trust. Never in my 35 years in the industry have I encountered a single case of a raw material supplier abusing this trust. Ideally it is in the best interests of R&D and marketing to make the raw material suppliers an integral part of the NPD process. Involve them in all stages including future plans for new launches well in advance of their inception so that they can marry their own NPD plans to yours. It makes good sense to involve raw material suppliers even a step earlier and to seek their input during the new project design stage by marketing and the R&D teams. This will add a vital extra dimension to the evolution of the final brief. It will also help reduce false starts and accelerate the development process in the early R&D stages. Make it standard practice for marketing to give R&D cost targets as part of the NPD brief. Involving and seeking advice from raw material suppliers at this early stage helps with agreement on a realistic target and avoids cost hikes during later stages of the project development. It is not unreasonable at the evolution stage of a new project to challenge the marketing department to give a clear indication of projected overall sales. This information not only helps the R&D to understand the project potential but also helps decisions on the optimum resources to put behind the project. This information shared with the raw material supplier helps them to react and formulate project support policy commensurate with the project potential for them. Raw material suppliers fully understand the insatiable need of the cosmetic industry for constant innovation and NPD. The very large number of new raw materials launched at showcase annual events such as in-cosmetics, Suppliers' Day and many others is testimony to that. Raw material suppliers always endeavour to satisfy this need. R&D and marketing however need to recognise that an enormous amount of financial and technical resource goes into this effort, so it is therefore not unreasonable for raw material suppliers to expect a fair return on their investment. They are happy to supply all technical information generated along with samples to any customer without actively applying any means test to see if every customer has potential or commitment to offer a significant return on their efforts. In return it is not unreasonable for them to expect feedback on the performance of the samples and the supporting technical information they have supplied in good faith and free of charge. Many raw material suppliers lament the fact that R&D ask for a large number of free samples, technical and regulatory information and in return offer no feedback on the product performance or the potential projects the raw material is being evaluated for. Clearly this sort of one-sided relationship cannot remain a recipe for a sustainable partnership but it is still common practice within the industry. If R&D and marketing want to encourage new raw material development and innovation then it is vital that they take a close look at their relationship with the raw material suppliers and take steps to support them with advice, feedback and above all help them to focus their efforts on developing raw materials which give them a good return on their investment. This includes steering them away from developing 'me too' raw materials with no potential that do not offer any additional significant benefits to large numbers already on the market. Looking at the large number of new raw materials launched every year, I therefore have to question whether such numbers are necessary. Raw material suppliers should focus on launching fewer new raw materials that offer unique benefits in addition to what is already on the market. It wouldn't surprise me that the 80:20 rule applies to all new raw materials - 20% of all new raw materials resulting in 80% of the turnover. That's a terrible waste of resource in anybody's eyes. Raw material suppliers should sound out R&D and marketing and seek their support on potential raw materials and opportunities before putting a product in the market. Encourage and develop this two-way relationship - help them to help you. It's in the best interests of the whole industry. Raw material suppliers wholeheartedly desire the active participation of the marketing department as part of the tripartite team with R&D. However they expect R&D to give scientific support to the team, not only for marketing to understand and appreciate the complex science behind raw material suppliers' products but to moderate any irrational marketing expectations and claims. Suppliers are happy to deliver what is scientifically possible, are irritated by marketing claims based on fear rather than positive science, are frustrated by requests for new raw materials allowing insufficient development time and they rightly expect robust R&D support. Raw material suppliers want their customers to realise that any customer service costs money. This cost is passed on as part of the overall pricing package. It is therefore in the customer's interest to be moderate in their demands. An important part of customer service that the customers overlook is the request or expectation of visits by the sales and technical team of the supplier. With dramatic progress in IT technology it is possible to achieve the same result, eg via Skype conference call or webcam. Similarly technical and regulatory information can be obtained from the internet site of the supplier or by email. Let's not forget that mutual loyalty is a vital part of a quality relationship. For it to work it has to be a two-sided commitment. A large proportion of raw material suppliers bemoaned the fact that companies demand and expect loyalty from them without offering the same commitment in return. They are quite happy to use the full confidential know-how and resources of the raw material supplier during project design and development but later change suppliers to gain the slightest advantage. It is generally the purchase department which is able to get better prices from suppliers who have not made the same investment in the raw material know-how or supported the selection process by the customer. It is vital that R&D and marketing, who are reliant on the support from the raw material supplier during the current and any future development process, maintain the stewardship of this relationship and get management support to ensure that the purchase department toes the line. Failure to do so will naturally attract a reciprocal reaction from the raw material supplier. The raw material sector fully understands the frustrations of customers when applications of a new raw material developed by them is patented by another cosmetic company, thus preventing anyone else from using that raw material. There is no easy solution to this issue. Often it is the large multinationals who are responsible for taking out these restrictive patents and since they generate very significant turnover with raw material suppliers the suppliers are naturally anxious not to upset this important relationship. All I can say is that they are actively considering various options to create a level playing field for everyone to remedy the situation. One option is for raw material suppliers to take out their own application patents. This takes considerable time and resource. In order to take this risk and get a return on such an investment a raw material supplier has to pass this cost on to customers and needs key customers' commitment, preferably in advance, to ensure that this raw material gets used in significant quantities to justify the cost. At present no such failsafe mechanism exists to ensure that this happens We are lucky that the cosmetics industry enjoys the unique benefit of such a close and cordial relationship between raw material suppliers and users. Any improvements that both parties can implement to further help this relationship flourish and evolve is bound to yield even greater dividends for all in the future. Supporting this is clearly in the interests of everyone.